The straightforward design and functionality of these classic steel slat receptacles are great in virtually any indoor or outdoor setting. Built ready for high volume, easy maintenance use with a 36 gallon capacity and ergonomic swing door side access. Constructed for long-lasting performance with a MIG welded frame and are finished in a weather, corrosion resistant powder-coating. 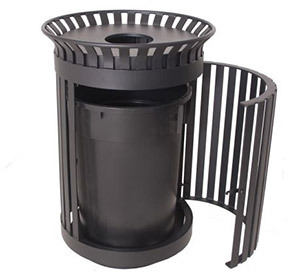 36 gallon rigid poly liner is included with the selection of flat top, rain bonnet or ash urn lids available.